Pipal tree (Ficus religiosa), a native tree of India, held sacred by the Buddhists, who believe that Gautama Buddha received enlightenment under a Bo tree at Bodh Gaya. The Bo tree attains great size and age; the leaves, which hang from long, flexible petioles, rustle in the slightest breeze. Description of the Plant: Large tree. Flower color red. Flowers in February. Fruits in May / June. Widely found in uplands and plain area. Plant Parts Used: Root / Bark / Leaf / Fruit. of various colours like red, yellow and white are tied around Pipal tree trunks especially in Northern and Western parts of India. This ritual is performed especially on the Vat Savitri puja day (May – June). 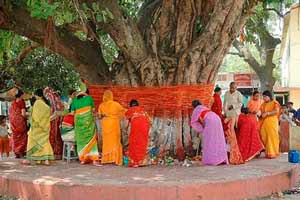 During Vat Savitri Puja, the Banayan or Pipal Tree symbolically represents Brahma, Vishnu and Shiva. The root of Vat Vriksha is Brahma, the stem is Vishnu and the upper part is Shiva. The Pipal tree plays an important role in the famous story of Satyavan Savitri. It is believed that Satyavan spend his last moments under a Vat or Banyan tree on the full moon day in month of Jyeshtha. And Yamraj appeared here and Savitri pleaded with Yamraj under the Banyan tree. In memory of this event, women go round the Banyan tree for 108 times tying threads and fast for the health and longevity of their husbands. The Pipal tree represents the tree of life and is sacred in Hindu Religion. It supports life of all sorts and is famous for its long life. The pipal tree also has the property to purify air. The cotton thread is just the opposite The cotton thread represents the fragile nature of life, love, trust, faith – and all things that go on to make up a relationship. A single thread may be weak, but, when it is wound 108 times around the trunk, it becomes strong. It is no longer so fragile and no longer easy to break. By walking around the tree 108 times, the wife contemplates on these matters. Love can only be strengthened by trust, faith and desire to make it work! With each step, the woman strengthens her relationship with her husband. She prays not just for her husband’s long life, but an enduring relationship that will last beyond this life and into the next.
. WKD : fruit kigo for late autumn . 118 Japanese haiku about the fig, ichijiku　!!! Jal-trang is a musical instrument. is an Indian melodic percussion instrument. It consists of a set of ceramic bowls tuned with water. The bowls are played by striking the edge with beaters, one in each hand. Jal-tarang finds its first mention in Sangeet Parijaat. the months of Saawan and Bhaadon bring bliss."
. Month of Sawan (Savan) in Punjab . Banyan is viewed by Hindus as the male plant to the closely related peepul or bodhi tree (Ficus religiosa). very briefly and superficially: the three holy months are Rajab, shaban and Ramazan, and Ramazan is the month of fasting, the month of the revelation of Quran, the complete fulfilment of all of God's promises to Adam. In these three months all thoughts of conflict are strictly forbidden. Rajab commemorates the beginning of Mohammed's life on earth(Ragaib) as well as his ascension to heaven(Miraj) and the special gift to him of the five times a day special prayers people can make, and the 15th of Shaban commemorates all of God's mercies and gifts and benefactions. The holiest night of the year, the Night of Power is hidden somewhere during Ramazan. Usually it is honored on the 27th of Ramazan. Today happens to be the 6th of Shaban. The end of August is when ripe fresh figs appear in the markets. The first to appear are the deep dark purple almost black figs. Later the light yellow figs appear. Tomatoes in August are the best during the year. Melons (kavun) in Turkey in august are indescribable. Yellow on the outside and pale lovely green inside. Watermelons (karpus) are heavy and ripe, but not so big as US of A.
august watermelons, but a whole lot sweeter.